After each Open House, as we pack up the leftovers and get ready for the game night that immediately follows the party (my reward), my husband and I take notes about what recipes worked and which ones didn’t. Basically a post-mortem. What should I make again? What was too much effort for the payoff? What looked gross after two hours at room temperature? How much did I make? Was that too much or not enough? Was there something that I really liked so I didn’t mind if there were leftovers? These notes aren’t gospel – one year I made 2 pounds of shrimp and we ran out halfway thru the party, so the next year I made 4 pounds and no one ate any shrimp that year! – but they give me a starting point when thinking about the next year’s menu. Our Dessert Table last year. Yes, everything there was made from scratch. Unfortunately, my notes from last year are more detailed about each savory dish than all the sweet stuff, probably because I’m tired after this party and details for 50 dishes are a lot to write down. I do remember that most people filled up on savories and didn’t leave room for dessert, so we had lots of sweets leftover. 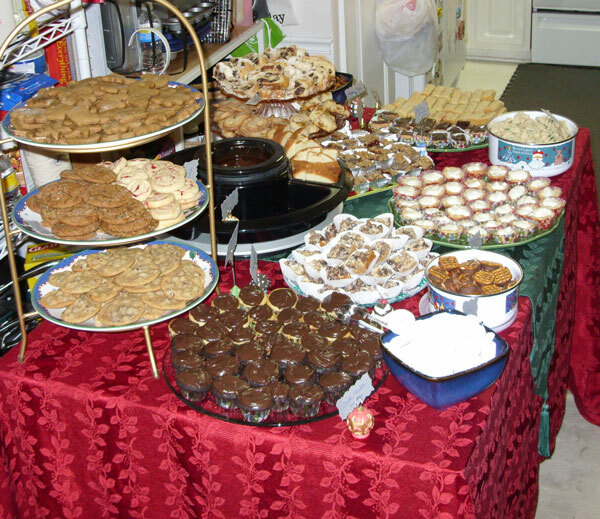 I think the dessert table this year will focus almost exclusively on cookies: bar, drop, and rolled. As I can make most of those ahead of time, it should be win-win. What about you? What dishes are tried and true entertaining fare? What recipe will you never do again? Let me know in the comments! You know I’ll be there! To help, to eat and then to play! Watch out chicken bites and raspberry streusel bars, here I come!